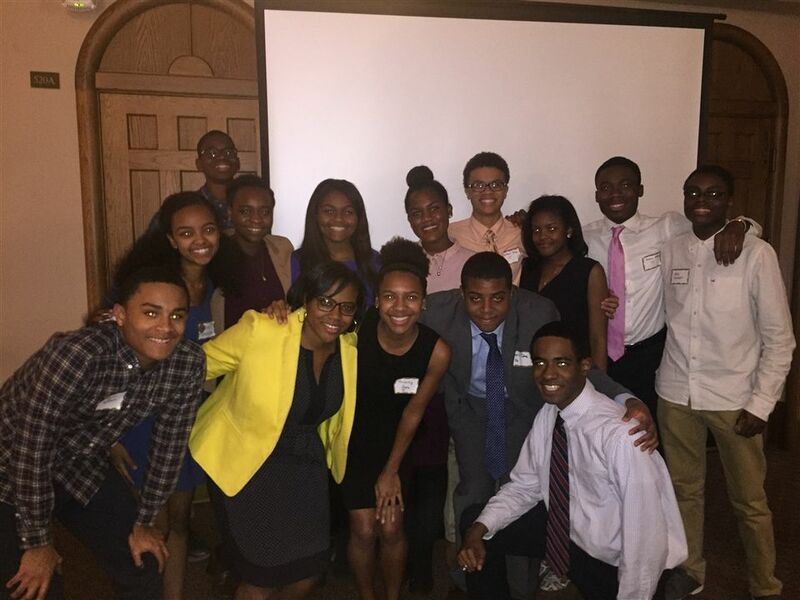 The Claver Society was founded in 2014 after a successful Summer Soiree event. The society is named after a Jesuit missionary who labored tirelessly with marginalized people in Aftrica. Various events are hosted throughout the year including the Summer Sioree and a speaking even in the spring. 100% of the annual membership donations directly support the Claver Endowment, an endowment created in 2001 by Arthur Reliford, Sr. '72, to maintain a diverse student body of the brightest minds throughout greater Chicagoland. The Claver Society hosted the biennial Summer Soiree on Saturday, August 4th to benefit the Claver Endowment. The endowment was established to provide tuition assistance to our African American students in need of tuition assistance. Over 200 guests gathered to honor Dawn Hasbrouck ’94 for her outstanding service and leadership. The evening was a tremendous success as 100% of the $100,000 raised will be designated to the Claver Endowment. This year we will be able to provide 5 students with tuition assistance. We are very grateful for the outstanding committee that organized and steered the success of the Summer Soiree. Our 2018 Committee: Sheila Harris, Patrice Louis '04, Kimberly Mason '85, Abraham Matthew '05, Gerald S. McCarthy '80, Malik Murray '92, Art Reliford, Jr. '92, Christine Riley '93, Curtrice White Scott '90, Valerie Barker Waller '83, and Erin Toole Williams '87. See photos from the event. 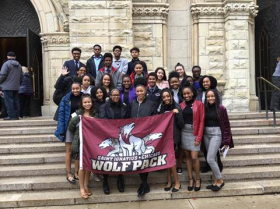 Thanks to the generosity of the school's St. Peter Claver Society and Art Reliford '72, a large group of Saint Ignatius students were treated to a viewing of the Marvel Comics blockbuster movie, Black Panther. 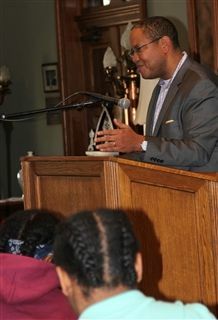 The students began their day by attending the 40th Annual African American Heritage Mass. More than 80 alums, present parents and friends of the school gathered for a reception and presentation. Mike spoke about the Obama Foundation, his four years as Senior Advisor to President Obama’s Chief of Staff as well as his four years at his alma mater! 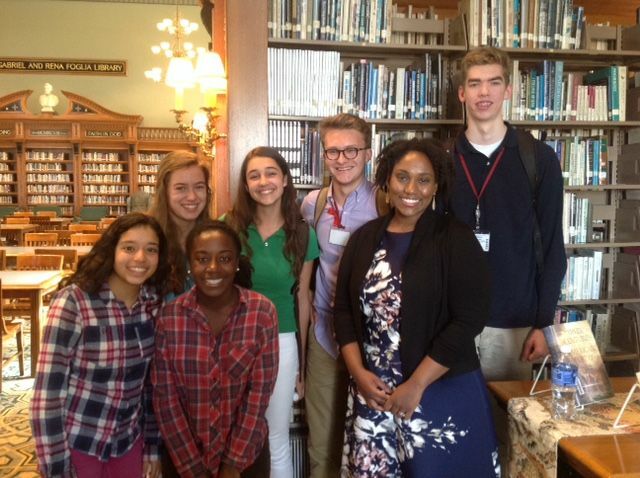 Mike also spoke to dozens of students in the Foglia Library and engaged in a lively Q & A and took an extensive tour of the school with BOSS members, Kennedy Springfield, '19, Brittany Mensah, '19 and Helena Gebremichael, '19. We would like to offer a sincere thank you to Mike for taking the time to spend the day with Saint Ignatius! Tom Pikarski ’89 and Maureen Gilhooly Pikarski ’90 were the raffle winners for the Claver Society Chicago White Sox private suite raffle! The game was held on Monday, July 31st 2017. (The Feast of Saint Ignatius of Loyola). Tom and Maureen hosted members of their family, including Maureen Pikarski Murphy '87, Jack Gilhooly '87, John Pikarski '20 and Mr. and Mrs. John Pikarski, Jr. (honorary alumnus) for a memorable evening watching the White Sox play the Toronto Blue Jays. All proceeds went to the Claver Endowment. Congratulations to the Pikarski family. Thank you to all of our generous supporters who purchased tickets and thank you to Comcast Sports Net for their generous donation. The Claver Society welcomed back members of the school community to the annual Claver/BOSS Welcome & Farewell Potluck on Sunday, June 4. The event took place in the Fr. Grant Quadrangle and McLaughlin Room where guests enjoyed drinks, burgers, and hot dogs. The event served as a chance to say good luck to outgoing seniors and welcome incoming families. Special thanks go out to Erin Toole Williams ’87 and Christine Riley ’93 for coordinating the event and to David Fuller ’91 for providing his grilling services. On Saturday, August 6th, the Peter Claver Society hosted the Summer Soiree and welcomed over 150 guests for a cocktail party and reception honoring Art Reliford '72. All proceeds supported the Peter Claver Endowment which provides tuition assistance for African American students at Saint Ignatius. Thank you to all of the event sponsors and all who attended. See more photos from the event. The Claver Society and student group BOSS hosted a welcome & farewell potluck on Sunday, June 5, 2016 in Tully Hall. The attendees had the opportunity to say good luck to outgoing seniors and welcome incoming families. Thanks to all who attended. On Monday, November 23rd, more than twenty BOSS students along with many Claver Society members and Fr. Michael Caruso, S.J. gathered for the first annual Vision Board presentation and dinner at Saint Ignatius. The BOSS students created vision boards depicting their goals, aspirations, and mentors. Following the board presentations, all enjoyed a buffet dinner and lively conversation. Thank you to Cheri Smith, Art Reliford ’92 and Curtrice White Scott ’90. On Sunday, August 6th , Saint Ignatius and The Peter Claver Society welcomed over 150 alums and friends to the Claver Family Picnic. The day was filled with great food, old friends and generations of Ignatius families! We are grateful for all of the support from our alumni and friends of the school who donated their time and services! We will continue this tradition and will host the next Claver Family Picnic in June of 2016. Dr. Marcia Chatelain Yapelli ’97, Assistant Professor of History at Georgetown University, visited Saint Ignatius as part of her book tour for her newly released publication, South Side Girls: Growing Up during the Great Migration. She can be seen below with students after her talk in the library. The Claver Society then held an evening reception where Chatelain Yapelli ’97 spoke about her book. Read Marcia's biography on the Georgetown University Website. Saturday, August 2nd kicked off the inaugural Summer Soiree to benefit the Claver Endowment. 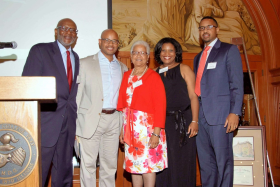 With the generous help of Gerald McCarthy ’80, Curtrice White Scott ’90, Erin Toole Williams ’87, Valerie Waller ’83, Art Reliford ’72, The Alvin Bell Family and Kevin Conway ’69, the event was a huge success and over $50,000 was donated toward the endowment. Will Evans ’73 was honored at the event. View the event photo gallery.